So glad to see you're looking for a really safe option. As you pointed out, so many harnesses are not up to the job needed on a boat. We use a mountaineering harness for dogs, the RuffWear DoubleBack harness. It meets all your criteria and is SAFE! We use it to lower our golden retriever from the boom into the dinghy. My only wish is that Ruffwear could add some floatation to it. Perhaps if we boaters banded together? Wow, that is one serious harness. I like it. Have you used it for swimming? Had any problems with rust? Anyone with experience with this one? I"ll bet a Sail Repair Shop could replace the rusted parts on the Harness with S/S..
And if the repair shop loves Doggies-- They just might do it for free.. I know just the place too-- Red Head went by it already though.. The Red Head crew uses the Ruffwear vests - they're great. 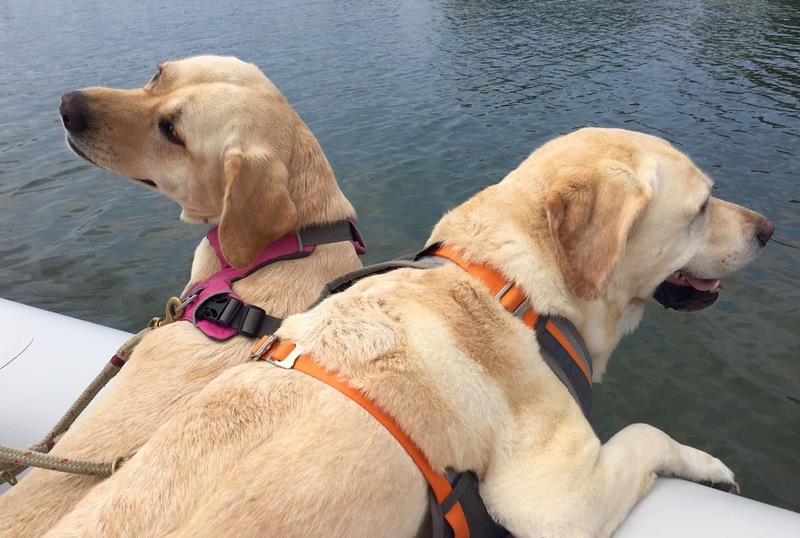 If you don't have a life vest for your canine crew, check out the article and get one today. We're still hoping to find a harness solution,so keep your input coming! No suggestions, but we are glad to see the discussion. 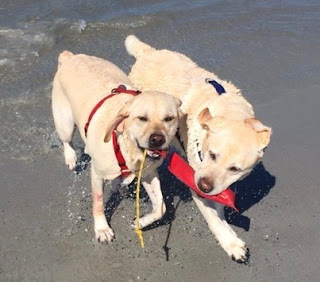 We are in the market for a new harness for our 12 /12 year old lab, Jake, who is beginning to have issues getting on and off the boat and with stairs. He needs a little helping hand. A great harness that meets many of your criteria is this one. Does have plastic clips and coated metal hardware, but my dogs have given it a lot of abuse and it has held up. Plus it comes in a bunch of fun colors. Another option is Canine Outfitters. We got my dog's flyball harness there. The harnesses are all handmade and he does a lot of custom work so he may be able to work with you to create exactly what you are looking for. Follow up comment re: swimming in Double Back harness--I have a golden retriever who doesn't care to swim. She will wade so we do get the harness wet in salt water. But don't have any information about how the harness holds up to daily swims. I found the Sleepy Pod interesting... But had some questions and sent a request to them last week. I've heard nothing back after several days which concerns me. I always say that customer service never suddenly gets better after the sale. How did you find their customer service? I just ordered some of this...http://www.microcortech.com/....it was featured in a Boating Mag test and may solve the metal problems on your harness. It may solve tons of boat problems, particularly on a steel boat! From their website, "MC-300 has a dielectric characteristic, so it’s safe on electronics and completely shuts down electrolysis between dissimilar metals. You can use MC-300 on anything you don’t want to rust, including engines, generators and anything related to boating and sailing, including saltwater and coastal environments". I don't have anything to do with the company, just a boater down here in Jax on the Ortega River. Passed Red Head several times while you were here, awesome boat. I just ordered a Kurgo Impact Harness for our cross country car trip. 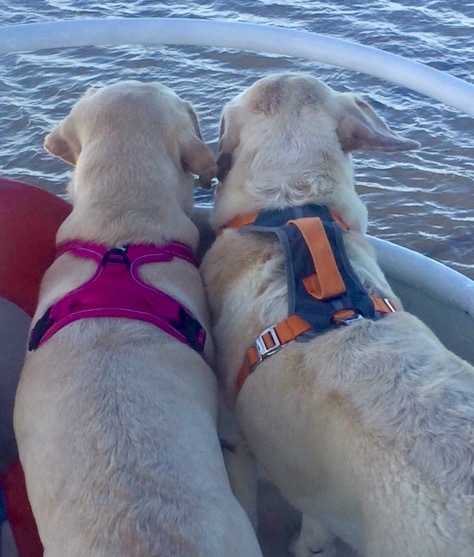 I am still looking for that all purpose harness for the boat. 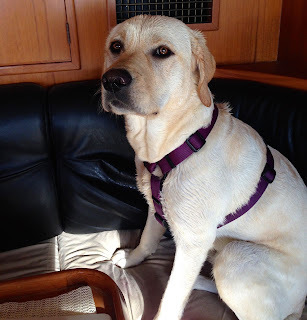 I use the Ruffwear life jacket on the boat for certain conditions and love the handle. Peppe is 32 lbs. and I use it to lift him off the boat and on to the dock. But again it is bulky and hot for conditions where you do not need a life jacket but want a harness with a handle for nice conditions. I am following your research. I just talked with your contact at Kurgo and she was very helpful. Thank you for all your work on this subject. I just got the Kurgo Impact Harness for our car trip in medium for his 32 lbs. It fits well and the two handles at the top for the seat belt are super strong. I am thinking it might also work for his light harness on the boat. 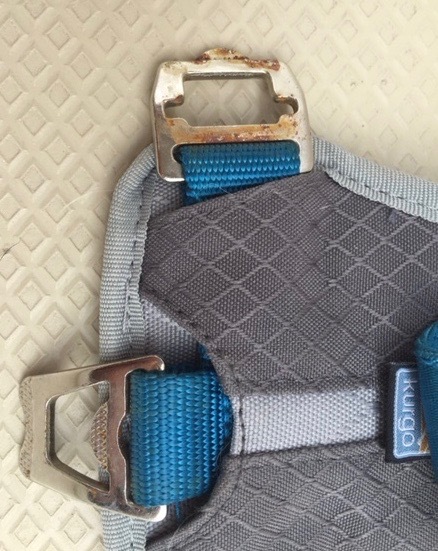 This harness is crash tested and the material is supper strong. Maybe you should take a look. I also got a Kong padded two handle Traffic Leash which has a super strong buckle. All for now. We now have a new member of "the Doghouse" crew a black golderndoodle Cairo who wears her sleepy pod anytime she is on the boat. She abides by the code "if you are looking for us... we are out in the doghouse"